Before we start, I just wanted to give you a little overview of what you can expect from all of my Foundation Files posts (to catch up, click here!). 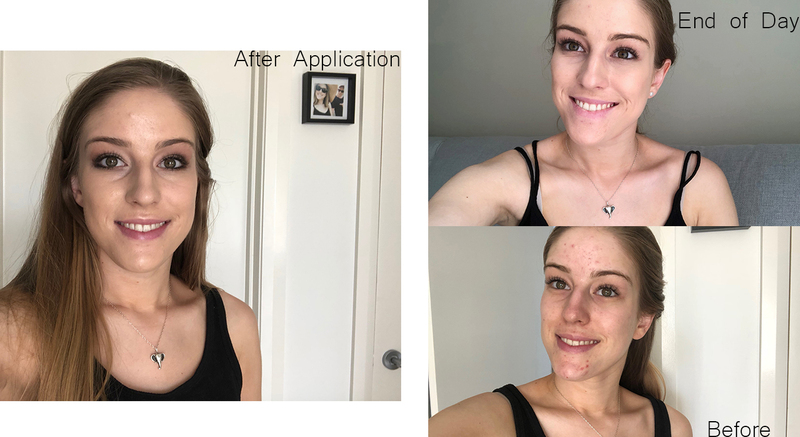 In each review I will give you photos of my skin before application, immediately after application and at the end of the day. I will talk about how I prep my skin before applying, as well as the method that I use to apply. I will also talk about the coverage and finish, as well as how well I think it wears throughout the day. Now as for my skin type (which will impact what I think of foundations) I have dry/normal skin. I do have blemish and pigmentation concerns, particularly in my T-Zone. Without further adieu, let's get into it! 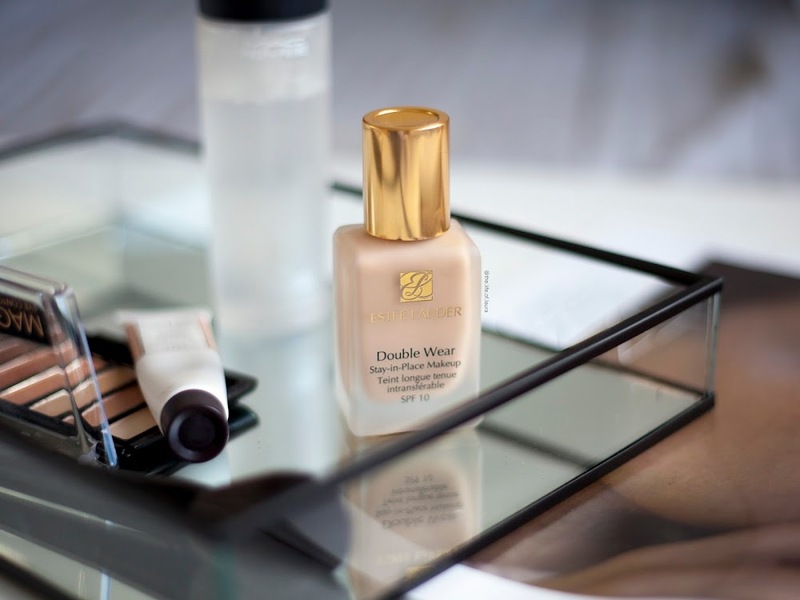 The Double Wear Foundation is a super long lasting foundation (24 hours even! ), made to keep you looking flawless all day. It's a worry-free, long-wearing makeup that stays fresh and looks natural through heat, humidity and nonstop activity. It claims that it won't change color, smudge or come off on clothes, but still feels lightweight and comfortable. I have wanted to try this foundation for YEARS, but having drier skin I have always been a little bit hesitant to try it out. After receiving a sample of it at the Beautyheaven 10th birthday in 2017 I decided to take the plunge and buy it. I have been wearing it since and have almost finished my first bottle. But do I actually like it? The foundation comes in a little glass bottle with a screw lid. My biggest pet peeve is that it doesn't have a pump. You can buy one for $10 and while I would 110% recommend buying one, I just haven't ever got around to getting one. It retails fro $58 and I wear the shade 1N2 Ecru. 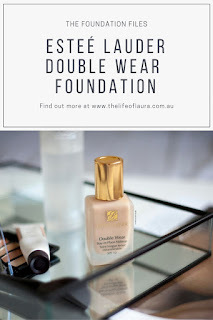 The finish is a natural, semi-matte finish and having drier skin I do go our of my way to prepare my skin a little bit more when I wear this foundation, especially if it is going to be a longer day. At the end of my skincare routine I will apply a slightly thicker moisturiser to keep my skin hydrated all day. As for primers, I use a bit of a mix when I apply this foundation. I will often start with a bit of the Smashbox Photo Finish Primer over the whole of my face. I will then go in with a bit of either the Bobbi Brown Extra Illuminating Balm* or the MAC Prep+Prime Moisture Infusion* in my t-zone, or in areas of my face where I tend to get drier. I find this helps to keep the foundation lasting better and more comfortably for my dry skin. To apply I put a little bit of foundation on the back of my hand and then use a damp BeautyBlender to apply it to my skin. I then take a fluffy foundation brush (my favourite is the Real Techniques Expert Face Brush) and blend out where I need to - typically around my jaw line and hair line, around my mouth and nose). To finish I then spray with some MAC Prep+Prime Fix+ Spray* as I don't like to set with a powder. I find the coverage is a medium coverage that is easily buildable to a full coverage. It is probably the fullest coverage foundation in my collection. It has a semi matte to matte finish, depending on how you prep your skin. When I have the Bobbi Brown Extra Illuminating Balm* underneath I find that it still looks glowy and luminous, despite having a matte finish. It creates the smoothest and most flawless veil over your skin, covering ever blemish and imperfection. It is my go-to on bad skin days as it can just cover everything! In saying that it also still looks natural. 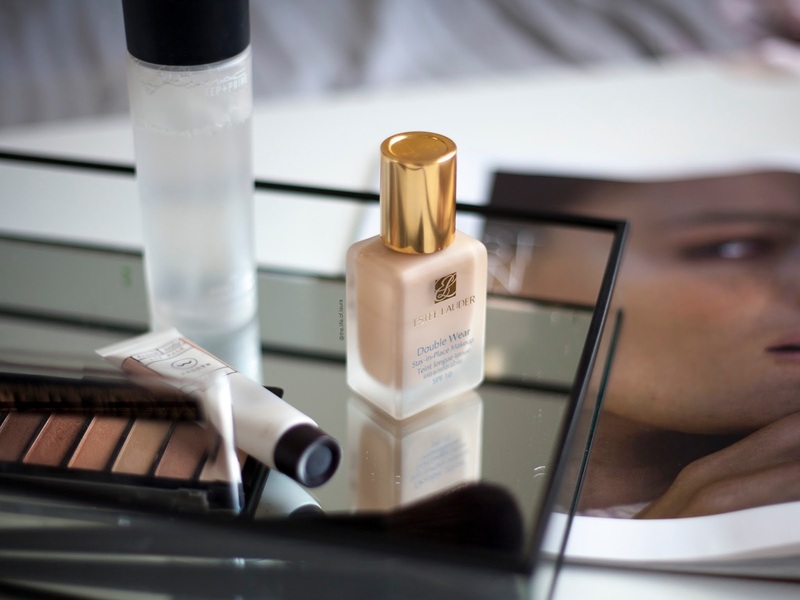 Being a fuller coverage foundation you aren't going to get that 'no make up' flawless look, but it doesn't give that super noticeable foundation look either. As for lasting power, I have to say I am always super impressed. I do find it goes a little bit patchy on my chin after a long day (as you can see in the photo below), but I don't know whether that's from eating or something else, rather then just the foundation as it doesn't happen anywhere else on my face. It is easily fix by blending with a brush or a damp sponge though. Other then that, it lasts extremely well, still looking full and flawless even at the end of the day. It doesn't oxidise or change colour either. In all honesty, it is the top pick for what foundation I would wear on my wedding day if I was doing my make up, the lasting power is that good. For a foundation that I was terrified to try, it has become one of my go-to and all time favourite foundations. Whether I am going to an event, have a long day, or my skin is just no cooperating, this foundation is perfect. I would give it a strong 9/10 (only 9 because I need to work out what happens on my chin throughout the day, and also because of the no pump situation).